The African continent is not only blessed with an abundance of rich human and natural resources, it also has a myriad of delicacies including mouth-watering seafood dishes that can rival the best of the best anywhere in the world. Although pescatarian or seafood dishes do not always make our traditional African menus, they are a great addition to spice up our everyday dishes. For a fact, most Africans are known for their love for swallows (starchy foods that are cooked to a dense paste and eaten with various soups)such as; Fufu, Amala, Poundo, Kenkey etc. These foods are those most people grew up with and are used to and as such most foreigners, even indigenes are not aware of the extensive seafood dishes that have been perfected in some part of Africa. It is quite interesting to note that some coastal African countries offer Seafood dishes that are basically just the infusion of sea animals into traditional dishes. Also, African islands do have a lot of seafood dishes that are heavily influenced by Europe and this is major because seafood dishes were not so popular in the past with the African people. Nonetheless, these 6 dishes should inspire you to look more to the sea than the forest when adding animals to your dishes. Most dish serving with prawns or fish in the same category are usually anticipated to be delicious – for instance, a pottage yam dish garnished with well-seasoned prawns is almost pure food magic. Talking about the Mauritanian Prawn Rougaille, this is a classic Mauritian dish made with tomato sauce, spices and herbs. The prawn can be switched up and modified for even extensive taste when cooked with beef or chicken if you so prefer but Prawns or crabs will also suffice and give you a delicious feeling as well. Shrimp coconut curry is a seafood recipe common in Tanzania. It is made with shrimps (sometimes substituted with prawns or crabs) and a mix of other spices. This sauce can be eaten with Rice or Chapatti. Octopus salad is as its name implies. This salad commonly found in Mauritius is the right combination of sweet, sour, and salty. It is also very delicious and a good alternative to everyday salad recipes we are already used. This is a soup common to Nigeria and most parts of western Africa. This delicious soup bursts with flavors of all the seafood added to it. 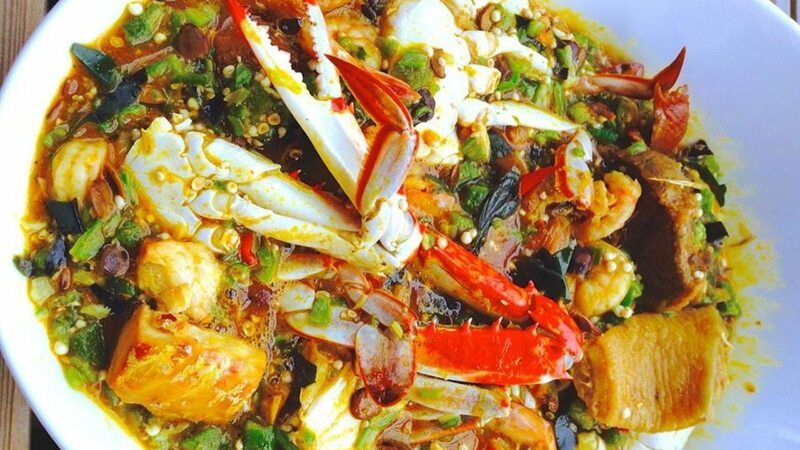 The beauty of this soup is that any kind of seafood can be used to prepare it, from fish to prawn to oysters, in fact, they can all be combined in the pot. This hot, spicy paprika-based river fish soup is one delicacy which is of a Hungarian origin. Okra soup is one of the easiest soups made in Nigeria and easily switched up a notch when the need arises. Seafood okra soup is a yummy alternative to the usual okra soup and can be eaten with any ‘swallow’ of choice. The traditional Okra soups in Nigeria were made with more meat from land animals than meat from the sea; but it is interesting to know that such soup can be made solely with meat from the sea and this gives a whole new taste to the familiar soup with bursts of flavour that will take you on ton a good journey food wise. Named after the Kenyan city, Oysters Mombasa has its origin from Kenya and is a different take on seafood. Its combination with rice is one that is gaining popularity in Kenya and major parts of Africa. It is an oyster dish that is usually baked and enriched with choice spices for incredible taste. In conclusion, though seafood delicacies are not easily associated with Africans, globalization is rapidly closing down on such presumptions. Now, an increasing number of Africans eat seafood and its preparation are also creatively put together with the infusion of African styled methods of cooking that can rival any seafood preparation methods anywhere in the world. So what are you waiting for, why not go ahead and try any of the best African seafood dishes in your locality and be amazed at the sheer brilliance of the taste.